If you haven't set up your Website Care plan, you'll need to do that first (it's fast) before you request an update for your site. 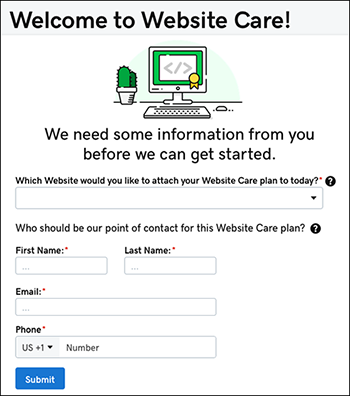 Under your Website Care plan, click Setup. Add the requested information to your form and click Submit. Note: If you only have one website, it will be selected by default in the first field. Quelle Version de Services Web professionnels utilise ? Quels sont les sites Web à partir des Services Web professionnels ?